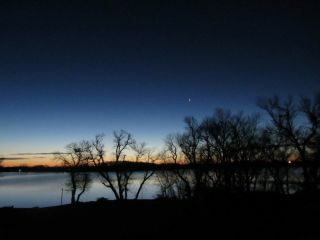 Night sky observer Brenda Steffes sent in this photo of the planet Venus shining in the night sky on Dec. 3, 2012. She writes: "This photo was taken from my back porch in Hendricks, MN." It's not the Star of Bethlehem, but early risers this month will likely notice a dazzling "star in the east" appearing a couple of hours before sunrise. That brilliant object is not actually a star but the brightest of all the planets, Venus. Peerlessly brilliant and glowing against the dawn twilight, is it any wonder why ancient stargazers named it for the goddess of beauty? And soon it will have some company, in the form of the moon. Venus stands low in the southeast as dawn brightens, but it will get a little lower each week. While it's currently rising in complete darkness just over two hours before sunrise, that interval will shrink to only 90 minutes by New Year's Day, when it will be rising just after the dawn's first early light. And if the weather dawns clear in your area early on Tuesday morning (Dec. 11), plan to head outside for Venus's conjunction with the lustrous thin strand of a waning crescent moon. The moon — currently only 5-percent illuminated — will appear to sit to the right and a bit below Venus as they come up above the horizon. From other places around the world, the pairing will appear a bit different primarily because the moon appears to move much more rapidly against the background stars than Venus, and also because of the effect of parallax: Different viewing angles from different points on our planet create different arrangements of some objects in the night sky. Be sure to have a clear and unobstructed view (no tall buildings or trees) toward the east-southeast to assure you a good perspective on this morning celestial show. Since the sun is now coming up after 7 a.m. local time, even those who do not normally look up may have their attention drawn to this dynamic duo during their normal commute to work or school. What will make this array especially attractive is the fact that it will look almost three-dimensional; the moon will look almost like a transparent and eerily illuminated blue and yellow Christmas ball hovering next to the brilliant-white diamond that is Venus. In a telescope, however, Venus is not much to look at: It appears as nothing more than a dazzling off-round dot, 90-percent illuminated. And here is a bonus: If you look after 6 a.m., also look for a bright "star" shining about 6 or 7 degrees below and to the left of Venus and the moon, though rather close to the horizon. Use your clenched fist, which at arm's length measures roughly 10 degrees, to determine the distance. If you succeed in seeing a bright dot, you will be looking at the innermost planet of the solar system, Mercury. Later in December, Venus will move into the constellation Scorpius where it will make for a dramatic pairing with the 2.8-magnitude star Grafffias on the morning of Dec. 18, standing only about 1/2 degree from the star. Venus will also act as a guide to the first morning appearance (called the "heliacal rising") of bright star Antares, as the planet will pass 6 degrees to the north of that ruddy star on the morning of Dec. 23. Venus will have one final month of morning visibility during January, before it disappears into the glare of the rising sun early in February. So catch it now while you still can, especially on Tuesday!